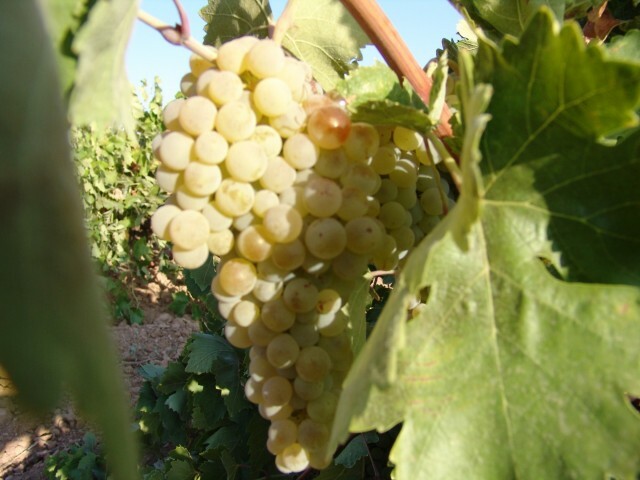 Airen is the most cultivated white grape variety in Spain with production focused mainly in the vineyards of Castilla- La Mancha and carrying the Denominación de Origen of Valdepenas or La Mancha. The vines produce loose long bunches of yellowish tinted grapes, which have soft pulp and produced a very slightly coloured juice. The variety is surprisingly resistant to drought, as well as being able to adapt and thrive in less fertile soils or extreme climates. Traditionally, the grape variety Airen has been used for bulk wine, due to the large volumes of Airen grapes available. It has been also been an important component in blends, being very delicate and almost neutral in flavour. Recently, wineries have re-discovered the potential of this grape and the use of modern wine making techniques has resulted in the production of attractive young fruity wines. Wines made of Airen are pale in colour, have interesting aromas of fruit (including banana, grapefruit or apple) with moderate acidity. The palate is soft and an easy drinking style, means that it can be paired with many food types; a wine for every occasion. Airen is also known as blancon, malvar, lairen, aiden, manchega or forcallat in other regions.